Wondering what you are going to do after graduation? Daunted or unexcited by the prospect of a four year college? Want to experience something different before going to college? Not sure if it’s worth investing so much money into a college degree? 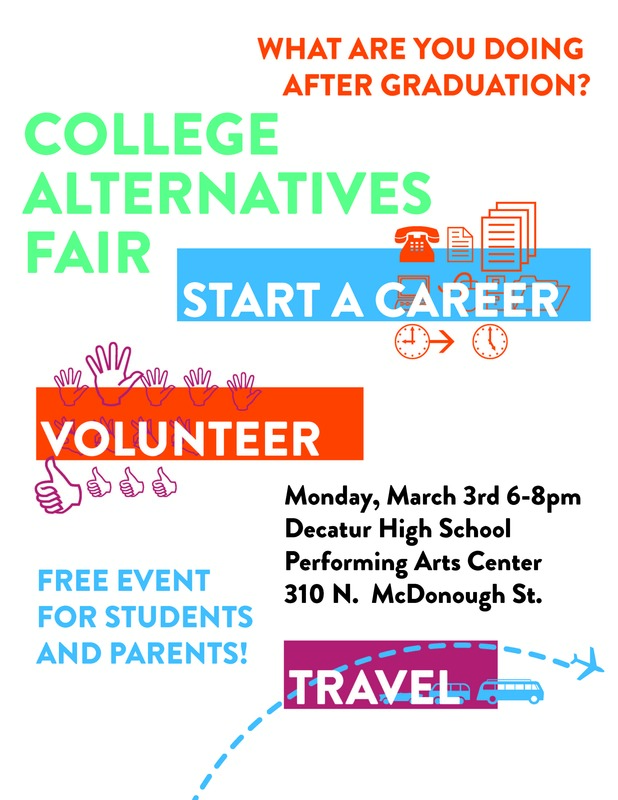 Get your questions answered at the Decatur High School College Alternatives Fair! The event will be held on Monday, March 3rd from 6 until 8 pm in the Decatur High School Performing Arts Center located at 310 N McDonough Street in downtown Decatur. Decatur Senior Haegen Altizer has gathered representatives from many different post high school opportunities to share exciting alternatives with students and parents. From gap year programs to career training and apprenticeships there are all sorts of options that you may not even be thinking about. The event is FREE! Come out and see what great programs might be right for you.